I’ve always been a little on the overweight side, but as soon as I got married it all went down hill from there. It affected every part of my life! From not being able to physically do activities, to plain out just wanting to hide myself because I was embarrassed of how I was. I woke up one day and said I don’t want to be like this anymore. I was sick and tired of hiding. Sick and tired of not feeling or looking how I wanted to look. Sick and tired of being on the sidelines of my life. So I woke up and changed. 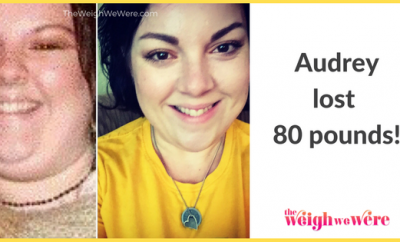 I decided that no matter what it took, I would get to my weight loss goals… and I did. First, I threw out all the unhealthy foods in my home. Out of sight, out of mind. I focused on eating healthy clean foods and drinking my water. 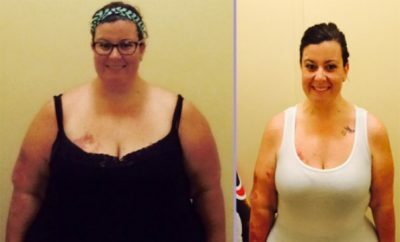 After I felt like I had that under control I jumped way out of my comfort zone and started CrossFit. CrossFit changed my life. It changed my mentality along with my physical side, and the support group I found there has made all the difference. It took a while for me to see results and it was really frustrating. I would say it took 50 pounds for me to start noticing changes, and for others to notice changes to. But I figured that if I was doing everything that I knew I should be doing, the results would come sooner than later, and they did. Facing the demons in my head. You know, those thoughts you put into your head saying “Quit.” “It’s too hard” “You are too slow” “You’ll never make it” “You aren’t good enough” Everyone has those demons. Once I figured out how to ignore all those thoughts I was having about myself, everything changed. Of course there were some hard times where I wanted to give up. So whatever it was that was frustrating me, I focused on something different. Like, say if the scale wasn’t going down, I’d find every single thing that was positive to keep me going. Like, fitting into smaller clothes. Running a faster mile. Doing things I thought I’d never do. I would celebrate every small thing in my journey… it really helped during the rough times to know that even though I was struggling and I wanted to quit, there were still so many positive things to look at. Yes, I’ve had many plateaus. 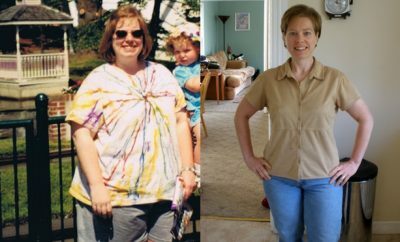 I overcame them by focusing on not what the scale said, and by changing up my diet here and there. I knew that if I kept making good decision after good decision the weight would come off, and it did. It took me about 3 years. That sure sounds like a long time, and it feels like a long time going day by day, but I look back now and it’s crazy how fast it seemed to really fly in the big picture of it all. When I was heavier I ate out a lot, I ate a lot of pastas, breads, you know, all that type of stuff. Now days, I’ve eliminated all that kind of food and replaced it with other foods that are just as delicious, and I don’t eat out as often. When I was heavier, lets just say I could barely move. When I started CrossFit, I couldn’t even do one sit up. I couldn’t run without feeling like I was going to die. I couldn’t do much because I was so out of shape! Now days, I can do anything I want. I can run, I can jump, I can do all sorts of things that I never dreamed of doing! Find something you enjoy doing physically. I fell in love with CrossFit. I’m addicted! So when it comes to getting exercise, I LOVE it, I don’t dread it! Surround yourself with people that have the same goals as you, they will help hold you accountable when the times get tough, and they will also be there to cheer you on with the times are awesome! Drink your water. (1/2 your body weight in ounces) It’s magical! It will do wonders for weight loss, energy, your complexion… so many benefits to drinking water! You don’t have to cut everything out all at once. For some people that can get very overwhelming. Focus on one thing at a time, if you have to. Each good decision, each step in the right direction…it all complies into something big. Wow excellent result, hard work and it paid off, Amazing! Good job! You look amazing! 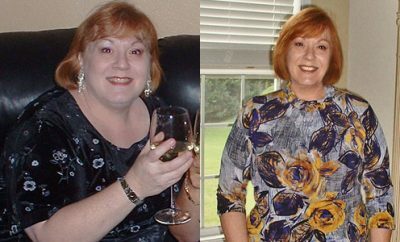 Story was very inspiring,as of today im gonna start out slowly on my change of eating and a moderate exercise program. Very inspiring and i can’t wait to get there! Looks great. lots of hard work. 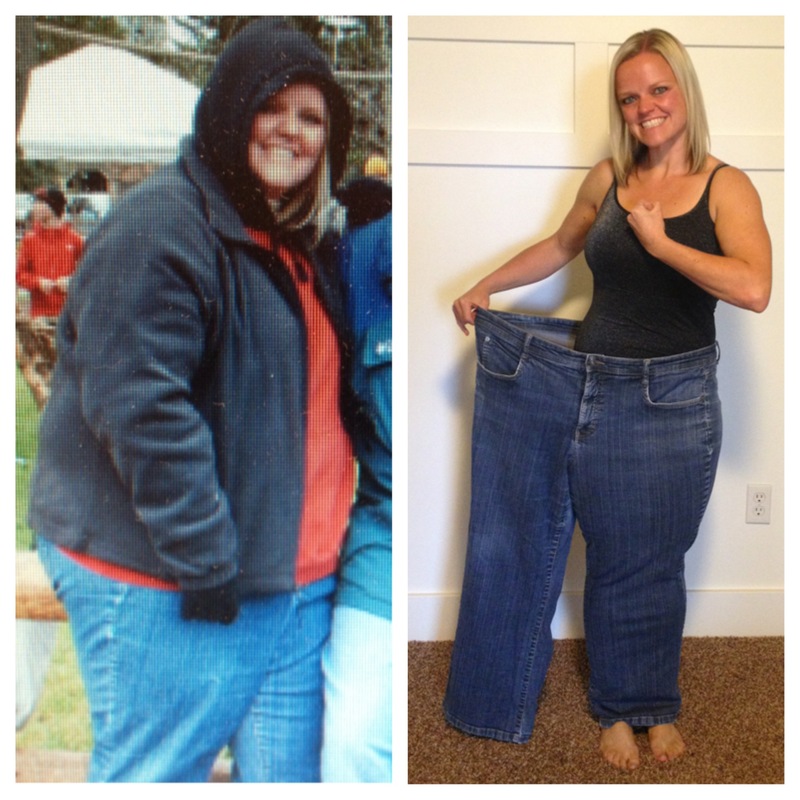 You are a big inspiration I lost 100 LBS and feel grate but my journey is not over . AWESOME!!!! I love the whole LOOK in the OLD pair of pants. Can’t wait to do that myself.